She played four years of soccer, basketball and softball at Bristol Eastern as a member of the class of 1991. Eastern’s basketball teams were Class LL champions in both 1990 and 1991. Among the honors she garnered in high school were being named All-Conference in each sport, and a two-time All-State pick in basketball. Ginny was named the MVP of the state All-Star game and was honored as Connecticut’s Gatorade Player of the Year for girls basketball. She scored 1,100-plus points during her Eastern basketball career. 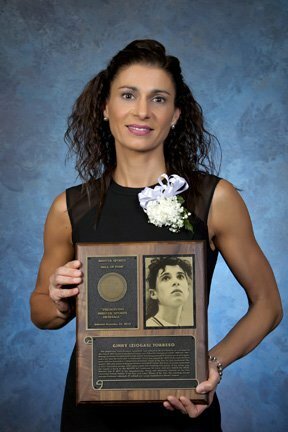 She went on to play basketball at Pace University, scoring 1,540 career points and recording 378 assists. In her senior year, she earned a berth on the All-NYC All Conference lst team, and was named the ECAC Women’s Div. II MVP in the championships. Ginny was ultimately honored as the Pace University Female Athlete of the Year and Letter Winner of the Year. Her coaching resume includes freshman volleyball, JV softball and varsity basketball at Bristol Central.